In this section, you can edit your site's width, change top navigation bar, change placement of boxes on the pages and add custom boxes. 1. 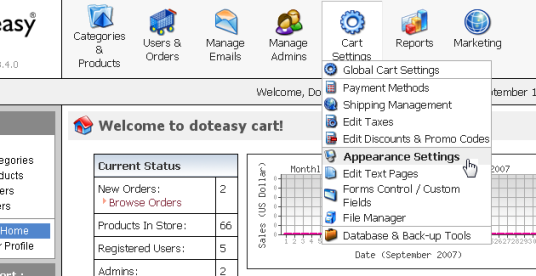 Click on the Appearance Settings option under the Cart Settings menu. 2. 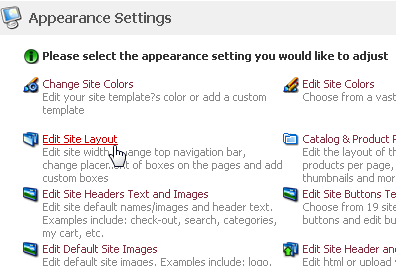 Click on the Edit Site Layout link on the Appearance Settings page. 3. The Edit Site Layout page will open, as shown in the figure below. 4. Site Width & Align. 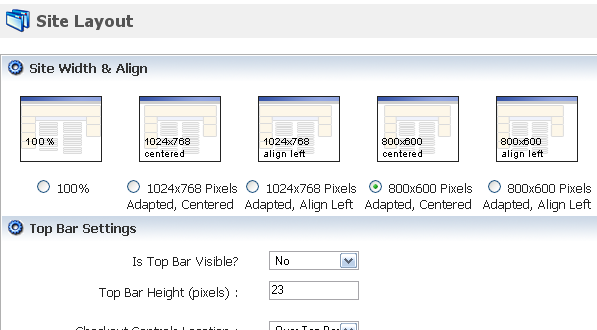 Select the site width and alignment by clicking on the respective radio button. 7. Custom Boxes Settings. Here, you can add, edit or delete custom boxes. To add a new box, click on the Add a New Box link. The Site Box page will open and you can create the custom box. 8. When you are ready, click on the Save Changes button.